Well, maybe not death but obese or, as my brother has dubbed me, "EXTREME muffin top" by chocolate. 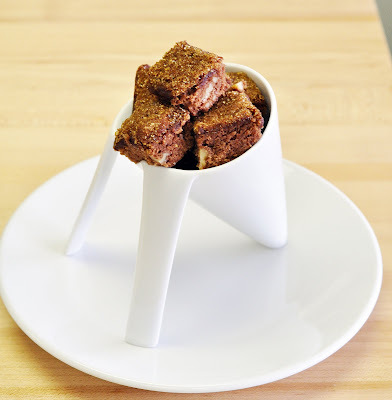 It's definitely been harder to shed the pounds since I've started this food blog. With the dishes I make comes frequent tastings which then invariably leads to the extra pounds. Even bordering on depression as I continue to try and wriggle my way into what was once my "comfortable jeans" I still can't stay away. Least of all with chocolate. I didn't really do it on purpose but the last few dishes I've made all were chocolate. Last Wednesday for small group I made some brownies. 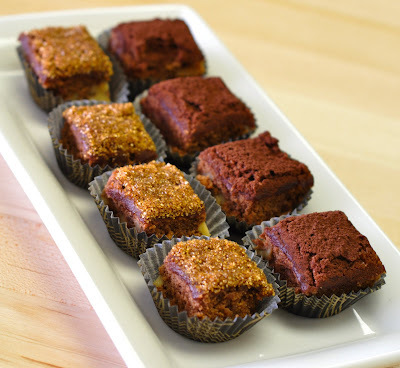 I pulled a recipe from Dorie Greenspan's Baking: From My Home to Yours called Honey-Nut Brownies. Preheat the oven to 325 degrees and prepare a 9x9 baking pan lined with foil then butter it. Melt the chocolate and butter in a double broiler (a pot of boiling water and a stainless steel bowl on top of it) or you can melt it in the microwave in 20 second increments. 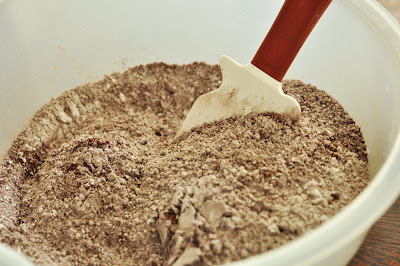 In a standing mixer, with a paddle attachment, beat the eggs and salt on medium high heat until light and foamy. Add the honey, sugar, vanilla and beat for 2 minutes, or until well blended and smooth. Reduce the speed and slowly add the chocolate/butter mixture. Mix until just incorporated. Still on low, add the flour until the flour is just mixed in and disappears into the batter. Fold in the nuts with a rubber spatula. Pour into prepared baking dish for about 45-50 minutes or until a knife inserted in the center comes out clean. Let cool and cut into desired squares. I cut them into bite size pieces and dusted some with cocoa powder and dipped some in crystal sugar. A friend of a friend had asked me to make a cake so I made a Devil's Food Chocolate Cake filled with Chocolate Mousse and finished with a Bittersweet Chocolate Ganache. The cake recipe was one I learned from culinary school. Still my favorite recipe. Preheat oven to 350 degrees and prepare desired baking pan. I used 2 sheet pans lined with parchment paper. 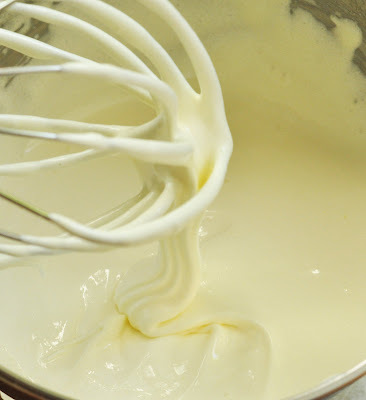 In a standing mixer, with a whisk attachment, whip eggs and sugar until "ribbon stage" which just means until the batter starts to sit on itself and resembles a ribbon. Sift all the dry ingredients. 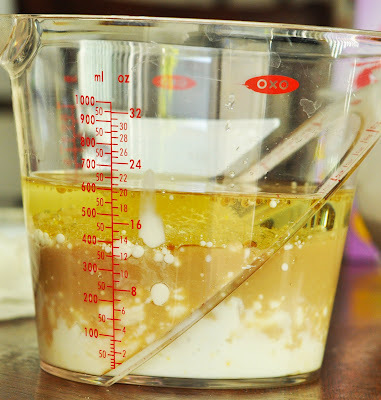 In 3 alternating batches add the dry ingredients to the egg and sugar mixture then the wet ingredients. Make sure to scrape down the mixing bowl after each addition. 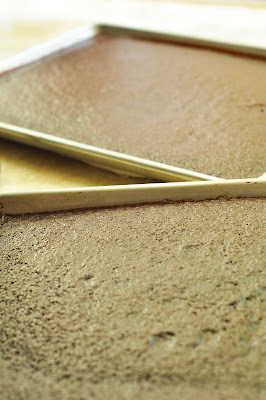 Pour into desired baking pan and bake until a knife comes out clean when inserted into the center of the cake. Or, you can just press down lightly on top of the cake. This is what's called the "spring-back" test. When a cake is fully done the cake bounces back when pressed on. It was a 6" cake which is pretty tiny. I ended up using maybe one pan in total. I cut out 6" cake layers using a cake cardboard round as a stencil. 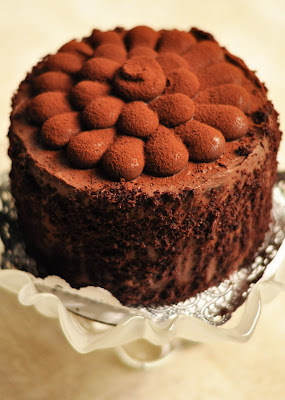 Chocolate mousse was used for the cake as well but it's incredibly time consuming to make and to describe. Maybe another day I'll post this recipe. Essentially, what I did to make the cake was I lined the inside of a 6x3 round cake pan with what's called an acetate strip. It's a thin clear piece of plastic used for purposed like this. This ensures you being able to unmold the cake once layered and properly chilled. When you do this you get a perfectly round cake which is ideal. The mousse is hard to work with sometimes so doing this ensures none of the components to go anywhere. I used 4 cake layers and about 4 cups of mousse. I chilled it for a night. The same day the cake was made, I made some ganache (recipe in an earlier posting) and left it at room temperature overnight. This lets the ganache set up so you can use it like icing. This was used to ice the cake as well as pipe the design on top. To finish I coated the sides with left over cake that was crumbled and then dusted the top with cocoa powder. So much cake left over from the order that I had to make something out of it. These were originally called Rum Balls but I decided to make them into mini cakes instead. Put all in a food processor and pulse until it starts to form a dough ball. 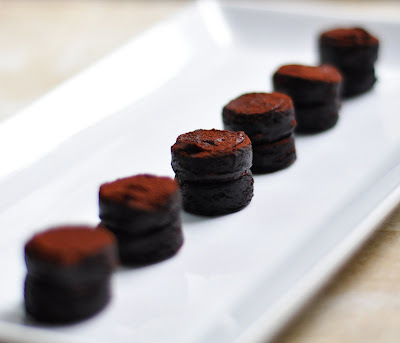 Start off with little bit of ganache and liqueur at a time. You might need more or less. Roll the dough out on 2 pieces of plastic wrap. Cut out bite size pieces. Sandwich 2 pieces with ganache and top off with more ganache. I actually wanted to pipe a cute design on top of each cake but the ganache started breaking. The butter started to separate from the rest of the chocolate. Don't know why it did that... so I covered it up ith some cocoa powder. My work got a crazy amount of bread samples a few days ago. One of which was a huge rectangular loaf of brioche. I saw it and immediately thought, "BREAD PUDDING!!" I haven't made bread pudding since my time at working at the restaurant (there's a horrible story which involves me over-baking a bread pudding for Dean Koontz but that will be told a different time). 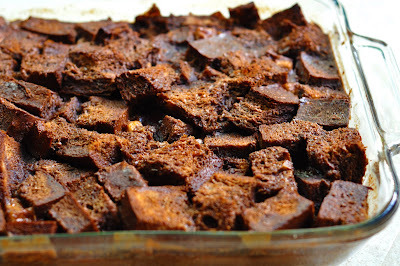 Bread pudding is relatively easy. It's a custard baked with bread. I used a Dorie Greenspan recipe yet again. But it came out underbaked. 12 ounces bread (I used brioche but challah or white can be used), Stale and cubed into 1"
In a 9x13 baking dish put the cubed bread into the baking dish with the raisins or banana. In a pot, bring the cream and milk to just a boil. In the meantime boil water in a tea kettle then turn off the heat. In a stainless steel bowl combine the eggs, egg yolk, and sugar. Whisk well. When the cream and milk are just about to boil, take it off the heat and slowly whisk it into the egg and sugar mixture. This is called "tempering". This method is used for most custards such as creme brulee and flan. It's done like this so the eggs won't turn into scrambled eggs. While it can be delicious, that's not what we're going for here. After all of the cream/milk is whisked in immediately add the chocolate and slowly stir until completely melted. Try not to create too many bubbles. Pour over the bread and with a rubber spatula squish down the bread so that it can soak up the custard. Let stand for 30 minutes making sure to periodically pressing down the bread. Bake in a 350 degree oven in a larger pan filled with the boiled water. This is called a "water bath". This ensures slow and even cooking with sensitive dishes like custards. The water should come up about 1/2 way. 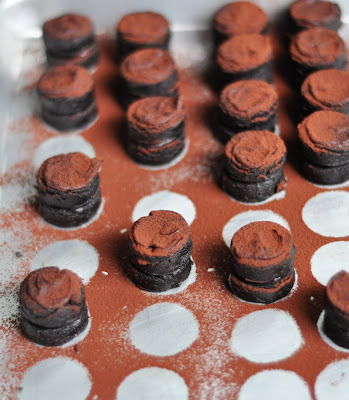 Bake for 35-45 minutes or until the top is uniformly puffed and dry. When you insert a knife in the center, it should come out clean. Here was my problem with it. I underbaked it, for one, and I used about 3 cups of heavy cream and 1 cup of fat free Lactaid. There was no whole milk in the house and I was certainly not about to run out of the house to get some (I baked these this morning so I could take to church). Another was I had double panned the sheet pans I used for the water bath. My oven tends to burn things on the bottom so I usually double pan everything. In this case, it could have done without. Oh well. People seemed to like it. Either that or they lied to my face. I'm gonna stick with the first choice. A little optimism is good for me. OMG, am I in Heaven? All those chocolate dishes are to die for! I'm drooling!